Like any professional project, searching for a concrete cutter requires hiring the correct people for the job. The difference with this niche is that there are additional factors that are critical to the success of a project when hiring a company to cut concrete. 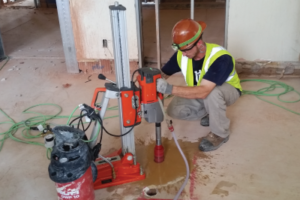 Safety should absolutely be a number one priority when selecting a concrete cutter. At EAI, we take worksite safety very seriously, maintaining an unbelievably low number of job site incidents since our founding over 30 years ago. If a company does not mention their commitment to safely finishing projects, proceed with caution. Cleanliness often goes together with safety. By keeping worksites as clean and clear as possible, EAI eliminates opportunities for accidents. Workers are also cognizant of nearby structures and surroundings to disturb as little as possible. It is worth inquiring about projected project lengths and how often a concrete cutter meets those deadlines. Some companies do phenomenal work, but don’t meet deadlines like they should. EAI knows that finishing a project within its projected completion date is a priority. To produce quality work, one must use quality equipment. EAI uses top-of-the-line tools and keeps them well-maintained. Concrete cutting equipment is also not a one-size-fits-all product. Any company claiming to have the ability to cut multiple sizes and materials should have the tools to match. EAI has the equipment to cut virtually any material you may need- concrete block, brick, stone, asphalt, etc. Just because a company has been around for many years, does not necessarily mean they perform their craft well. Companies should always check out a portfolio of work or references to see exactly the kind of experience that a concrete cutter has. Fortunately, EAI has both longevity of business and a sizable portfolio of clients to view. It is important to note that even if a company has tons of experience and projects to fill their portfolio, that doesn’t always equate to satisfaction of work. Look at online reviews or ask past clients about concrete cutters. Ask for their honest opinions about their experience working with the company. Getting the scoop from real-life clients can often help make a final decision, especially if multiple companies have bids on a project. Each of these factors will help determine the best concrete cutting company for your project. If a company is unable or unwilling to provide answers about their practices and policies, it is best to look elsewhere to avoid a compromising situation. If you have any questions about EAI’s work, please feel free to reach out to us. We would love to discuss your upcoming project.